The Maritime Museum of BC is proud to welcome volunteer judges, each experts in their respective marine-related fields, to the 2019 Classic Boat Festival! More details coming soon. David Huchthausen is a Fulbright Scholar, former University Professor and internationally recognized artist. His sculpture is included in the permanent collections of 80 major museums worldwide. David is Past Commodore of the Pacific Northwest Fleet of the Classic Yacht Association as well as the Fleet Historian. He has owned and restored classic power boats for more than 25 years. 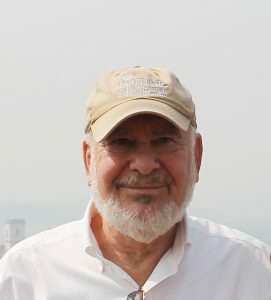 He is an avid historian and maintains the largest collection of motor boating and yachting magazines in North America. His yacht Zanzibar was awarded “Best Overall Power Boat” and “Best Engine Room” at the 2003 Classic Boat Festival. Rob found his passion for wooden boats while attending Sheri­dan College, where he studied furniture design. After attending the Wooden Boat School in Port Townsend, WA., he had the op­portunity to work alongside Paul Gartside, followed by years of servicing the wooden boat community on Southern Vancouver Island. His entrepreneurial endeavors led him to form a part­nership with Jean Gaudin. Their company, Abernethy & Gaudin Boatbuilders Ltd., has been building and restoring classic boats since 1999. Born on a farm in Switzerland, Ulrich couldn’t wait till he could run away to sea, but first he had to apprentice as a Cabinet Maker. He signed on with the Swiss Merchant Marine as deckhand and Ordinary Seaman, before becoming Ship’s Carpenter, and eventually Third Mate. In the 70’s Ulrich emigrated to Canada to work as a boat build­er with C&C CUSTOM Yachts. He soon realized that if he wanted to see the world properly, he’d have to do it in his own boat. When family matters called him back to farming again in Switzerland, he used what spare time he had to build a 34-foot double-ended ketch, Seeadler II. In 1980 he sailed her from Marseille back to Canada, to continue work at C&C. Finding that the economy had declined, he cast off from Lake Ontario with Margot Page as mate. Four years later they sailed into Victoria Harbour. Now settled in Duncan, Ulrich has built, repaired and added beauty to many of the classic boats on the West Coast. 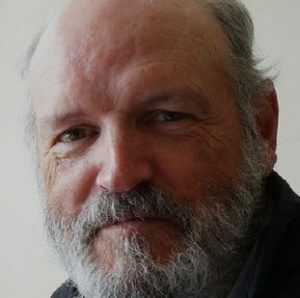 Martyn is the author of Seamanship Under Sail and numerous travel and nautical articles published in N. America, the U.K. and Australia. For several years he was Transport Canada’s sole consultant examiner for sailing ship endorsements. He is past master of the schooners Robertson II, Pacific Swift and the American privateer-replica Lynx, among others. In the 1970’s he fished commercially for the Prince Rupert Fisherman’s Co-op and has been involved in boat building and marine surveying in Canada and Europe. Martyn is the co-founder and former chair of the Canadian Sail Training Association, past director of the American Sail Training Association (now Tall Ships America) and former executive-director of SALTS, the Maritime Museum of BC and the Los Angeles Maritime Institute. He and his wife, Margaret, have collectively logged over 200,000 offshore miles under sail. Chris started out as a young boy watching Maurice Gronlund (and at times getting in the way), building and repairing wooden boats on the Fraser River. He joined the yard in 1977 and fished commercially on his own boat during the summer. He was part of the crew when Maurice built the Ocean Twilight and the Ocean Radiant. Chris worked with Maurice until 1993, at which time Maurice retired and sold the shipyard to Chris. Gronlund Boatworks continues to rebuild and maintain commercial and pleasure wooden vessels in a traditional yard, where the smell of oakum and yellow cedar still perfumes the air. Chris adds an in-depth knowledge of West Coast workboats to the Classic Boat Festival. 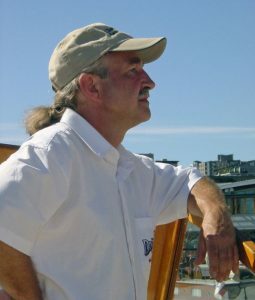 After completing a four-year boatbuilding apprenticeship tat started in 1980, Tony honed his skills as a shipwright specializing in wooden boat restoration, construction, and interior building, and has worked for various companies and private clients around the West Coast. Tony has published a number of articles, has lectured for various groups and classes and has done consulting work on boat interior design and manufacturing. In 1999 he began instructing at the Silva Bay Shipyard School on Gabriola Island and in 2003 became the school’s head instructor. Tony is now back working for himself as an artist, writer, part-time teacher, custom woodworker, and boatbuilder at his home shop tucked amongst the trees on Gabriola Island, BC. Carole has been a sailmaker and owner of Hasse & Company, Port Townsend Sails, since 1978. She became a sailmaker from a love of cruising having sailed 35,000 offshore miles in northern and southern latitudes on boats varying in size from 25’ to 101’. Carole’s first love is wooden boats. She was a partner in the building of a 37’ Pete Culler schooner and has owner her 1959 Danish built Folkboat Lorraine since 1978. 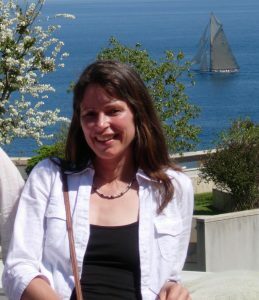 She has served on the board of the Northwest School of Boatbuilding and was a founding board member of the Port Townsend Wooden Boat Foundation and Festival. Well-known for her sail making and sail training teaching, she holds a USCG 110-ton near coastal license and is and ISPA instructor. Bent served his apprenticeship in Denmark as a shipwright and attended technical school there. He immigrated to Canada in 1955 and began working at Starship Yards in New Westminster on wooden commercial vessels. After moving to Vancouver Island, Bent worked in a produc­tion ship, building small cedar strip boats for Woodwards and Simpson Sears. He next worked for Port Alberni Marine on maintenance and building small wooden boats. In 1961, Bent moved to Sidney and went to work for Philbrook’s yard where he stayed for 13 years, rising to the position of foreman. In 1971, the family spent one year in Guana with the United Nations, teaching boat building. Bent returned to Philbrook’s where he stayed until 1974 when he left to set up his own yard. Over the years, Bent’s yard has earned an enviable reputation, particularly for their cold moulded boats. Ted is a highly respected West Coast boat builder based in Sidney. He was mentored by the legendary Frank Fredette and worked for many years with Peter London. He is an in­structor with the Quadrant Marine Apprenticeship program. Ted has built and restored a wide variety of Westcoast craft including both work and pleasure boats. He is particularly well regarded for his intimate knowledge and understanding of hydrolysis and corrosion in the marine environment. Phil apprenticed with David Hilliard’s yard in Sussex before coming to Canada in 1969 where he started with McQueen’s, moving on to Grenfell, Celtic shipyards, and the B.C. Forest Service before going out on his own and working as an inde­pendent shipwright. One of his projects was the restoration of the well-known cutter Cresset, a winner in the first years of this festival. In 1979, he and his wife Sandra bought Cove Yachts in Maple Bay. Over the past 30 years they have built Cove Yachts from one set of ways into a full service yard, developing a ster­ling reputation in the wooden boat fraternity, for both commer­cial and yachts, hauling and doing complete repairs to boats up to 80 feet. Jacqueline is a Master Mariner whose love for sailing began as a child in the Netherlands. She has been involved in the recrea­tional boating community since 1989 and is an Offshore Yacht­master ISPA instructor. Commercially, Jacqueline has worked as master and officer on various vessels including cruise ships, the Halifax pilot boat, Canadian Coast Guard vessels, and various eco-tourism charter vessels on both the Pacific and Atlantic coasts of Canada. Her experience also includes many years on traditional sailing ships in Europe, the Caribbean, and Pacific Coast. She owned and operated the 90-foot Traditional Steel Schooner, White Raven II, which she sailed from the Netherlands to Vancouver. Jacqueline attended the North West School of Wooden Boat Building in 2000. She now lives on Gabriola Island where she operates a boat canvas and sail repair business. She also instructs various Transport Canada Certified Courses at Camosun College in Victoria. Tad grew up in the BC coastal town of Pender Harbour, British Columbia, a logging and fishing hub, and always a haven for coastal characters. He studied at the Maine Maritime Academy (Yacht Design Institute) and then joined the Bruce King Design office in 1987 and spent 14 years there becoming principal design­er, working on a diverse range of projects. In 2001, he returned to the West Coast, this time settling and opening an office in Silva Bay on Gabriola Island. He has continued to design and consult in both power and sail. Tad is instrumental in helping keep the working legacy of our coastal boat culture alive. His community activity on Gabriola Island include organizing the successful shipyard raid, which importantly helps engage youth in boats. He is presently working on a new project, Documenting Historic BC Boats, which includes a book and a web site, to help preserve our BC maritime heritage.